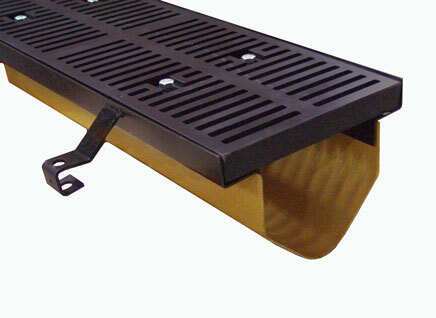 9872 -12" Wide High Capacity Fiberglass Trench Drain System - Jay R. Smith MFG Co.
Used in all surface drainage and may be assembled in any length utilizing 9 foot sloped high capacity channels to reduce installation time and labor. 9' Foot Long High Capacity Polyester Fiberglass Channel with Sloped Radius Bottom Surface with Male/ Female Connections Providing a High Integrity Lap Joint. Duco Coated Welded Steel Frame Support System with Concrete Anchors (One Pair Every 18 Inches). Supplied with Secured Load Class "E" Ductile Iron Slotted Grate.